Until I moved to Bloomington, Indiana, I lived for six years in the lovely mountain ski town of Flagstaff, Arizona. During my time in Flagstaff, one of my favorite bands, Wilco, inexplicably played a live show at the very small local events space, The Orpheum Theater. Wilco is better known now, but even back then they were too big of a band to be playing such a small venue, both in terms of popularity and equipment. As it turns out, I’m a gear freak too, but not for guitars—for marketing and productivity software. 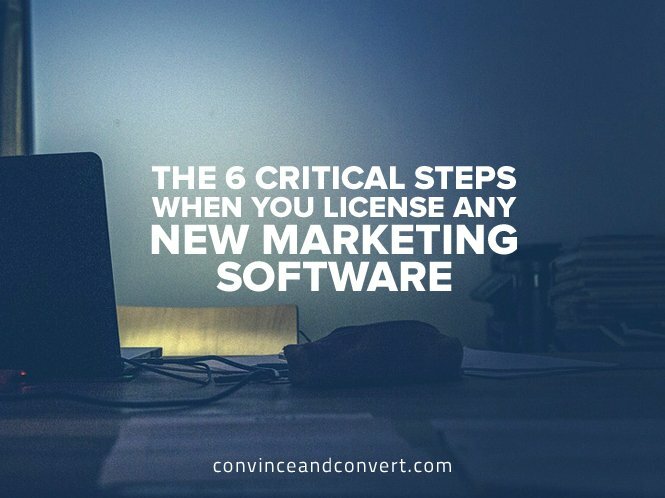 Before writing this post, I took a quick trip into the master file we use to track our software licenses at Convince & Convert. I found that we have 57 licenses to software packages, a number that shocked even me. Some we use for free in conjunction with sponsorship deals or because I am a part owner of the company as part of my angel investing. But the vast majority of them I pay for every month, and by any measure 57 licenses for a small company is a LOT. I have made a lot of decisions to use a lot of software, and I’ve subsequently rolled out a lot of software in companies I own. Sometimes I’ve done that rollout well. Other times, not so well. I want to save you the heartache and confusion of not rolling out new software well, so here are my six tips for not screwing up the internal adoption of the shiny, new package you’ve decided you absolutely must have. Someone in the company MUST love this software, understand exactly how it will improve the lives of your team, and be willing to do the dirty work necessary to learn the software inside and out and drive trial, adoption, and usage internally. The head of the company can serve this role (I do on occasion) but I’ve found it’s much more effective if someone who is going to actually USE the tool every day is the champion. It makes their advocacy more persuasive and relevant. And their ability to understand how the tool can be incorporated in workflows will be better than what I can offer from an executive perspective. Before committing to a new tool, write down (seriously, write it down don’t just do this verbally) EXACTLY what you will gain from use of this tool. Is it time savings? Error reduction? Better insights? Don’t just adopt a tool because it’s new and nifty. Identify what it will do for you, and if at all possible, add real metrics to that business case. How much time will it save? What new insights will it uncover, and how will those insights be used? This simple exercise (which I admittedly have been terrible at sometimes in my career) goes a long way to avoiding “shiny object syndrome,” where you get a new tool simply because it’s new. My friend Sally Hogshead is one of the world’s best public speakers, a terrific author with a ton of great books (including a new one on how brands can be more fascinating), and a brilliant consultant. One of Sally’s most powerful sayings is that “Different is better than better.” She uses it to describe the benefits of differentiation in branding and marketplace positioning, but it applies to new software adoption as well. If you are going to replace an existing software tool, the new tool must be a lot better than the old one and/or significantly less expensive. Otherwise, the staff time, hassle, loss of momentum and other “switching costs” make it unlikely that the change is going to be worth it—at least in the short term. And most software frankly isn’t that much better. It’s somewhat better. Instead, focus as much of your time as possible on software that is DIFFERENT from everything you have today. If the new package adds something that you do not have covered at all today, that is software you should consider (providing of course it meets the specific areas of improvement test above). The good news is that most software today has a lot of useful features. Software developers have gotten so good, and APIs have interconnected so many platforms, that even software built for a narrow purpose typically has multi-faceted functionality. Simply put, you get more horsepower for your money. But from a software rollout perspective, that can also be a detriment. Teaching the team how to use many features in a software package all at once can be incredibly disruptive, cause uncertainty and ennui, and often waste a ton of time. Instead, roll out new software in phases. Start with the THIRD most important feature. You don’t want to roll out the killer feature first because the entire tool will be new to the team and they’ll end up focusing too much on interface and process and not enough on usefulness of the feature. Once your champion leads adoption of the third most important feature, roll out the second most important feature. Now, people are most used to the tool. Then, roll out the most critical feature, once everyone is comfortable with the interface, etc. Finally, roll out any other features (fourth most important and beyond). Unless you are adopting software that really is different, not just better, chances are you may be faced with a scenario where you are paying for the old tool and the new tool simultaneously. These are dark days, as it feels like you are throwing money away needlessly. Do NOT cancel the old system for at least 60 days. The reality is that no software is going to be as easy to use and as painless to adopt as it seemed in the demo. Real people ask all kinds of questions – and do all kinds of questionably intelligent things – that they forget to ask or do in the software review and consideration process. In short, you cannot “cut the cord” until you have at least two, and optimally, all three, of the most important features fully launched and in use in your organization. Only then is it safe to sunset the previous tool. Marketing is a transient occupation. The team you have today is unlikely to be tomorrow’s team, at least not in full. So every time your champion trains a team member on how to use a feature of the new software, record the audio and on-screen video and archive it for later. The next time you have a new team member, he or she can easily watch the recorded videos to quickly get up to speed on key software how-tos. This saves your champions a ton of time as they can focus on answering specific questions rather than training from step one. If you’re like me, you love software. But software that’s not adopted is software that’s doing you no good. I hope you’ll consider following these six tips the next time you invest in a new package. Did I miss any?